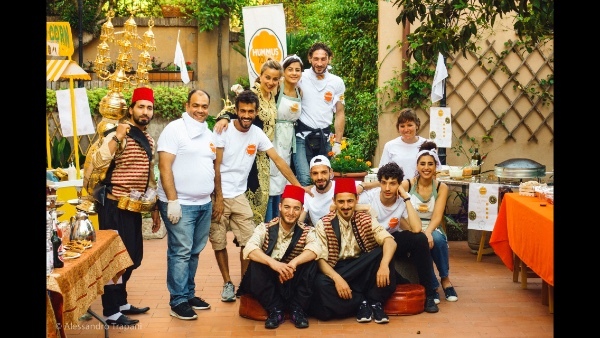 Hummustown helps refugees in Rome gain economic independence by providing them with a dignified income generating job opportunity: to cook, package and deliver delicious Syrian food around Rome. To expand the project and help even more refugees, we have an ambitious plan to raise money to acquire a project headquarters featuring an industrial kitchen, office space, meeting room and front of house reception for direct orders, as a formal and dignified workplace for the Hummustown team. We are also raising funds to cover the operating costs of the project for 12 months to allow this social enterprise to stand on its feet. Currently the Hummustown team work in the “donated” private kitchens of the project’s patrons and depend on charitable donations for operating costs. Our Story- WHO AM I? My name is Shaza Saker. I am a Syrian Italian living in Rome. I work for the United Nations Food and Agriculture Organization. In March of 2017, with the continued influx of Syrian refugees to Europe as a result of the war in Syria, I finally had enough of feeling sad, frustrated and helpless watching from the sidelines the plight of so many innocent people who were forced to flee their homeland only to face daunting and unknown variables. Rather than wait for the positive change that I was so hopeful would come from somewhere, I decided I wanted to be that change myself. The way I saw it, the main problem Syrian refugees face when they arrive to Italy, is that despite whatever expertise or skills they bring from their home country, they are at an immediate disadvantage because they lack the key ingredients for integration and the pursuit of gainful income: They don't speak the language and they don't have the network of support that would allow them to explore income opportunities. It would take these vulnerable refugees years of language training and remedial skills training to start being productive and economically viable. And that is when the idea of Hummustown came to me. The best way for these refugees to start earning an honest, dignified income is to allow them to offer the one skill that transcends all boundaries - their delicious Syrian culinary tradition. To overcome the language and network barriers they face, the project patrons (myself and my friends, colleagues and family) would support the project by providing all the required elements for these refugees to hit the road running. Namely, hygienic kitchens to prepare and package the food, a web site to promote the project activities, capital injection through charitable donations to sustain the project in its infancy, and no less important, the social and commercial networks around Rome to promote the project and allow it to find its client base. Ultimately, the plan has always been that once these refugees have sufficiently integrated, to allow them to be fully autonomous with the project and to have them provide support to new refugees. Every day, Hummustown gives these hard-working people the opportunity to cook and distribute delicious food all around Rome. Since the inception of the initiative, we have helped more than ten refugees become more financially independent and, by extension, more integrated in Roman life. Currently there are six refugees actively working as part of the team. Our goal is to help them attain full independence, to be able not to just survive in Rome, but to thrive and be able to remit money to their families back home. 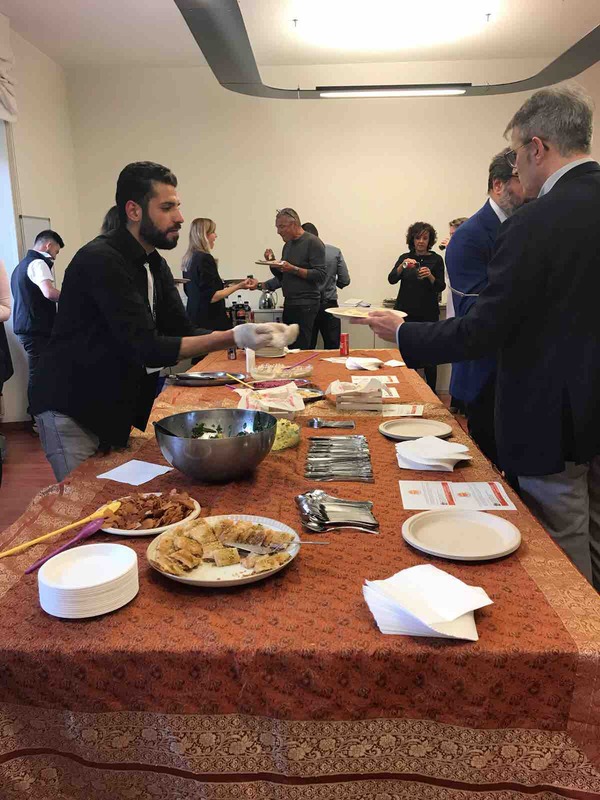 Hummustown is at the crossroads after almost one year of successful operation and a loyal following of supporters who recognize the win-win proposition of the project: They get to savor the most authentic, delicious, wholesome Syrian food in Rome, and at the same time help decent people get on their own feet by being financially independent. Refugees don’t want hand-outs or charity. They just want a chance. Hummustown wants to be just that. The chance. Hummustown has outgrown its initial humble roots of providing an immediate avenue for Syrian refugees to start gaining income, to the extent that today it requires a headquarters with an industrial kitchen to allow the project to expand and serve even more vulnerable refugees in need, while also giving the current team of Hummustown beneficiaries the dignity of having a real, formal work place to go to every day and feel fulfilled, productive and respected members of the community. The donations will all be flowing directly into the Hummustown Cooperative’s bank account. 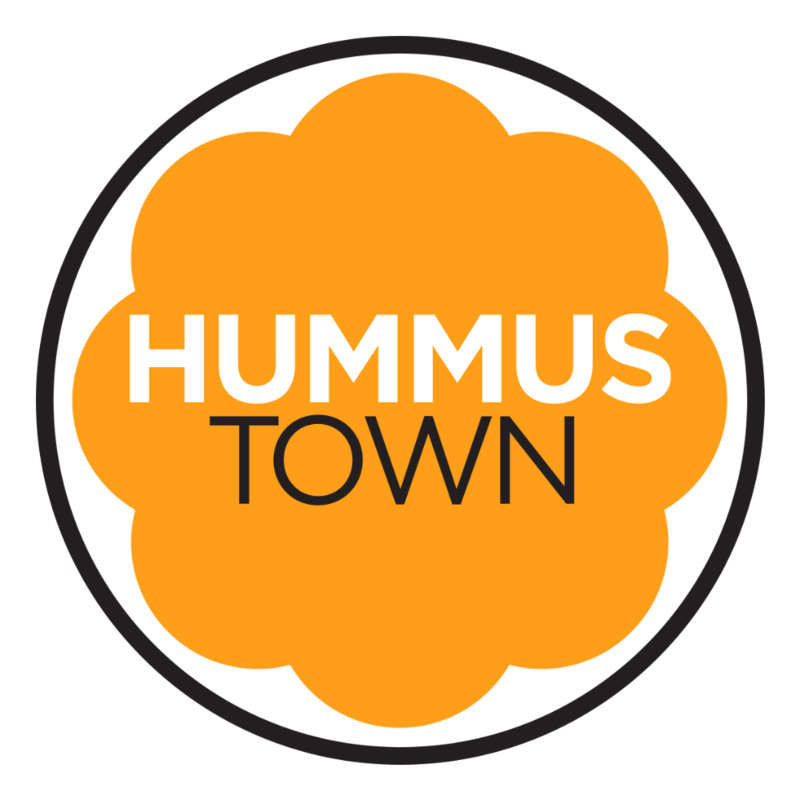 Through this campaign we are fundraising for Euro 100,000 that would allow Hummustown to have its own professional kitchen, office space, meeting room and front of house reception for direct orders. The budget also includes funds to sustain the project with one year of overhead costs. We will document every cent of donations spent and provide monthly reporting to the project supporters. We will also provide periodic written or video updates of the project progress. Myself and all the members of Hummustown are available to meet in Rome with any project supporter eager to know more about the project, and once the Hummustown headquarters are ready, its doors will always be open for any project supporter wishing to visit and know more about our activities. 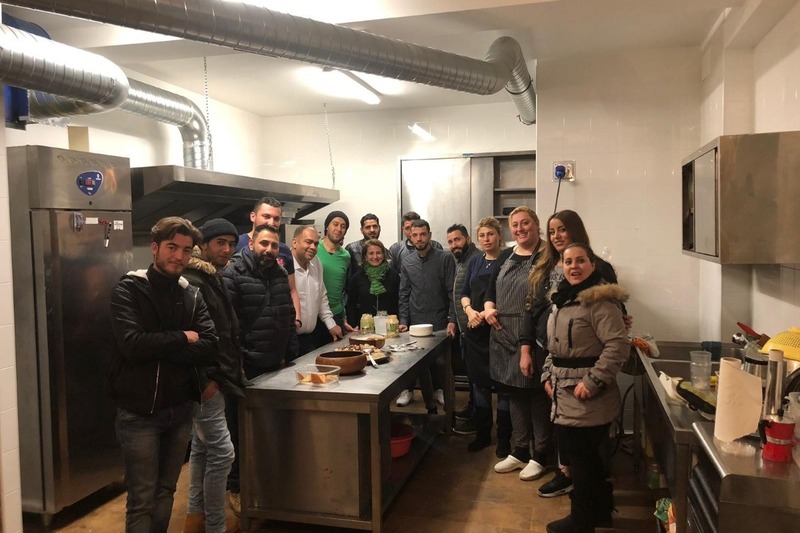 While we started out responding to the influx of Syrians to Rome, our big dream is to help all refugees use their cultural and culinary know-how to bring even more eclectic deliciousness to Rome. We’ve supported Ethiopian, Iraqi and Palestinian refugees in the past and are open to any suggestions. We want to alleviate the burden of refugee needs from the state, and to change the image of ALL refugees in Rome frome passive dependents to proactive independent members of the community who are net contributors rather than takers. Myself and the entire Hummustown team thank you for your being a part of this worthwhile project! 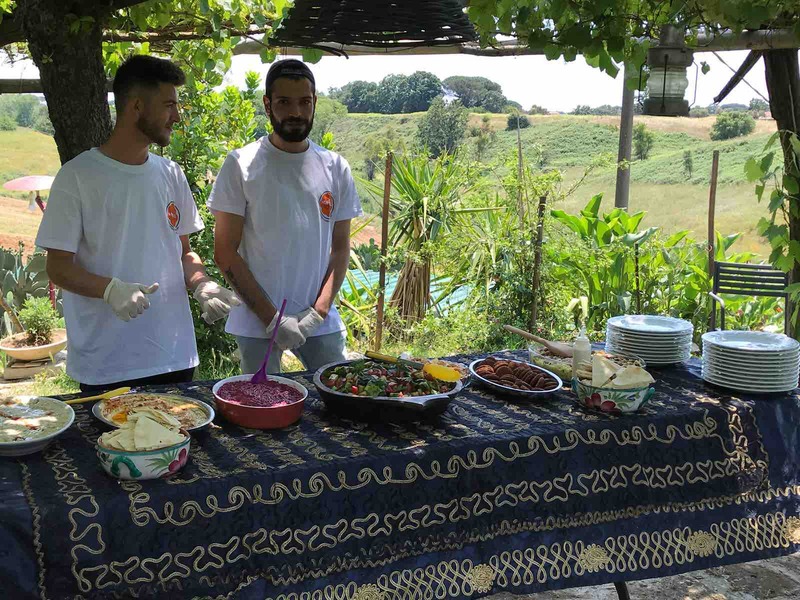 Hummustown aiuta i rifugiati a Roma a ottenere l'indipendenza economica offrendo loro un lavoro dignitoso: cucinare, confezionare e consegnare deliziosi cibi siriani a Roma e dintorni. Per espandere il progetto vogliamo acquisire uno spazio che includa una cucina industriale, uno spazio per uffici, una sala riunioni e una reception per gli ordini diretti. Stiamo raccogliendo fondi per coprire i costi operativi del progetto per 12 mesi e consentire a questa impresa sociale di spiccare il volo. Mi chiamo Shaza Saker. Sono una siriana che vive e lavora a Roma e voglio permettere ai rifugiati siriani di mantenersi dignitosamente portando la tradizione culinaria siriana a Roma. Per superare le barriere linguistiche che i rifugiati devono affrontare, insieme ad amici, colleghi e familiari ho fornito ai rifugiati gli elementi per poter iniziare questa impresa. Sin dall'inizio dell'iniziativa, abbiamo aiutato più di dieci rifugiati a diventare economicamente indipendenti. Attualmente ci sono sei rifugiati che lavorano attivamente come parte della squadra. Il nostro obiettivo è aiutarli a raggiungere la piena indipendenza e poter anche inviare soldi alle loro famiglie in Siria. I rifugiati non vogliono dispense o carità. Vogliono solo una possibilità. Hummustown vuole essere proprio questo. La possibilità. 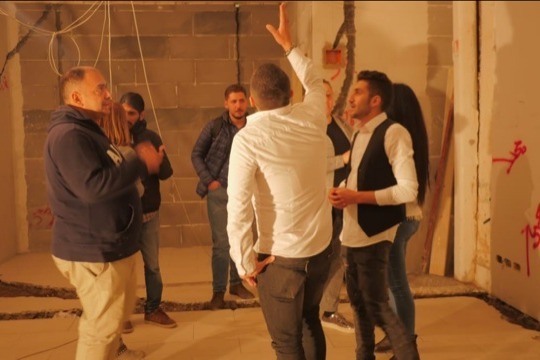 Attraverso questa campagna stiamo raccogliendo fondi che permetterebbero a Hummustown di avere la propria cucina professionale, un ufficio, una sala riunioni e una reception per gli ordini diretti. Il budget include anche fondi per sostenere il progetto con un anno di spese generali. Documenteremo ogni centesimo delle donazioni spese e forniremo rapporti mensili ai sostenitori del progetto. Forniremo inoltre aggiornamenti periodici scritti o video sullo stato di avanzamento del progetto. Io e tutti i membri di Hummustown siamo disponibili a incontrarci a Roma con qualsiasi sostenitore del progetto desideroso di saperne di più e, una volta che la sede di Hummustown sarà pronta, le sue porte saranno sempre aperte per qualsiasi sostenitore del progetto che desidera visitare e seguire le nostre attività. Mentre iniziamo a rispondere all’afflusso di siriani a Roma, il nostro grande sogno è quello di aiutare tutti i rifugiati ad usare il loro bagaglio culturale e culinario per portare ancora più prelibatezze eclettiche a Roma. In passato, abbiamo sostenuto profughi etiopi, iracheni e palestinesi e siamo aperti a qualsiasi suggerimento. Vogliamo alleggerire il fardello dei bisogni dei rifugiati dallo stato, e cambiare l’immagine di TUTTI i rifugiati a Roma da dipendenti passivi a membri proattivi indipendenti della comunità che sono contributori netti piuttosto che acquirenti. Hello to all Hummustown supporters! Exactly one year ago we launched our Crowdfunding Campaign to raise funds for our own professional kitchen. Thanks to your support (both financial and emotional), the wonderful people we met along this journey, and the tenacity and dedication of the young men and women of Hummustown who constitute the heart and soul of this project, we made it! 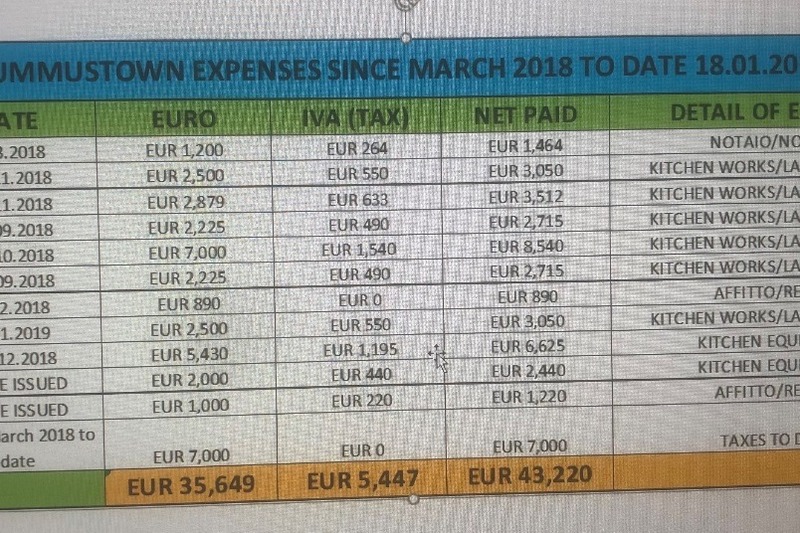 As promised in our campaign, we want to share with you the following expense sheet to document how every cent raised was spent. We raised Euro 36,600 – EURO 27,000 of which were donated online while the rest was from off-line donations, including various caterings and sales that were earmarked for the kitchen project. 2019 will be an exciting year for Hummustown. Now that we have settled in our new home, our next goal it to ensure our operating costs are covered. Our fix costs include, space rental (Euro 470/month), Executive Chef (Euro 1,500/month), and utilities (about euro 500/month). As a new year rolls in, we’re ready for all the exciting things we want to tackle, and we’re counting on you to keep the momentum of our success alive. Here are a few delicious ways you can support us. •	If you tried our food and enjoyed it, review us on our social media channels (Facebook Instagram) and tag us on yours! May your 2019 be filled with happiness and continued generosity, and may it be a kinder year for all refugees near and far. Buongiorno a tutti i sostenitori di Hummustown! Esattamente un anno fa abbiamo lanciato la nostra campagna di crowdfunding per raccogliere fondi per la nostra cucina professionale. Grazie al vostro sostegno (sia finanziario che emotivo), alle persone meravigliose che abbiamo incontrato lungo questo viaggio, alla tenacia e alla dedizione dei giovani uomini e donne di Hummustown che costituiscono il cuore e l'anima di questo progetto, ce l'abbiamo fatta! Come promesso nella nostra campagna, vogliamo condividere con voi la seguente nota spese per documentare come è stato speso ogni centesimo. Abbiamo raccolto 36.600 euro di cui 27.000 sono stati donati online mentre il resto è stato da donazioni off-line, tra cui vari servizi di catering e vendite che sono stati destinati al progetto di cucina. Il 2019 sarà un anno entusiasmante per Hummustown. Ora che ci siamo stabiliti nella nostra nuova casa, il nostro prossimo obiettivo è garantire che i nostri costi operativi siano coperti. I nostri costi fissi includono, noleggio spazio (Euro 470 / mese), Executive Chef (Euro 1.500 / mese), e utenze (circa euro 500 / mese). Con l'arrivo di un nuovo anno, siamo pronti per tutte le cose entusiasmanti che vogliamo affrontare e contiamo su di voi per mantenere vivo lo slancio del nostro successo. Ecco alcuni modi deliziosi per supportarci. • Se hai provato il nostro cibo e ti e’ piaciuto, scrivilo sui nostri canali social (Facebook Instagram) e taggaci sul tuo! Possa il tuo 2019 essere pieno di felicità e di continua generosità, e possa essere un anno più gentile per tutti i rifugiati vicini e lontani. FINALLY OUR KITCHEN IS COMING TOGETHER! CHECK OUT THE TOUR! Want to donate an item for our new kitchen-to-be? ❤️Thanks to YOU for getting us so far! We managed to hit the Euro 30,000 also thanks to the many Catering requests!